Spring has sprung here at TCJ headquarters, and to celebrate, I've got a look at one of my favorite British royal floral tiaras: the Snowdon Floral Tiara. 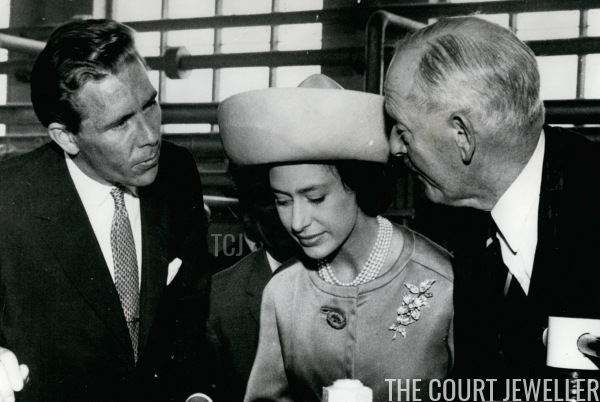 The tiara began its life as a trio of diamond floral brooches, offered to Princess Margaret as a wedding gift by Antony Armstrong-Jones in 1960. Above, she wears one of the brooches for a visit to the Stork Margarine factory in Cheshire in June 1962. Here's a closer view of one of the brooches from that engagement. The brooches feature diamond-set petals and leaves set on branches. The naturalistic elements of the brooches are designed with edges that look sort of "sharp" from a distance -- they're definitely not soft, romantic floral designs. Margaret continued to wear the brooches, usually for evening occasions. 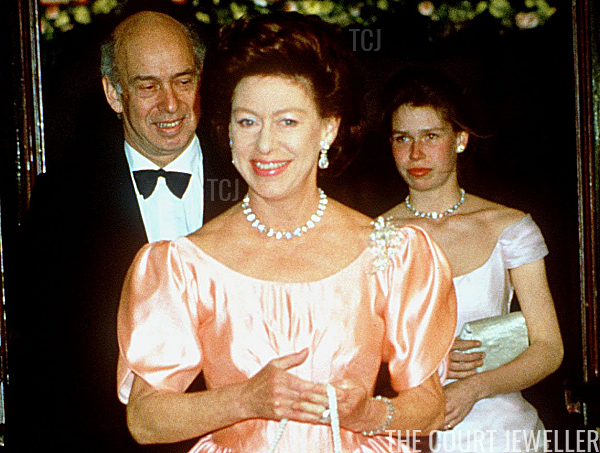 It's tough to be sure, thanks to the quality of photographs from the era, but I believe Margaret is wearing one of the brooches at her shoulder in this photo, taken at the Queen's 60th birthday celebrations at Covent Garden in April 1986. Eight years later, the brooches were transformed into a new piece of jewelry: a tiara for Margaret's daughter, Lady Sarah Armstrong-Jones. 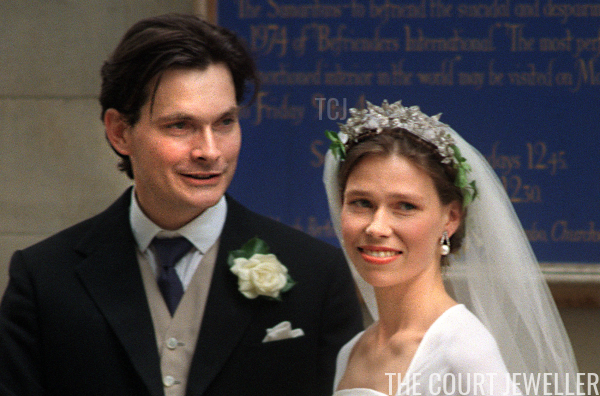 She wore the sparkler at her wedding to Daniel Chatto in July 1994. 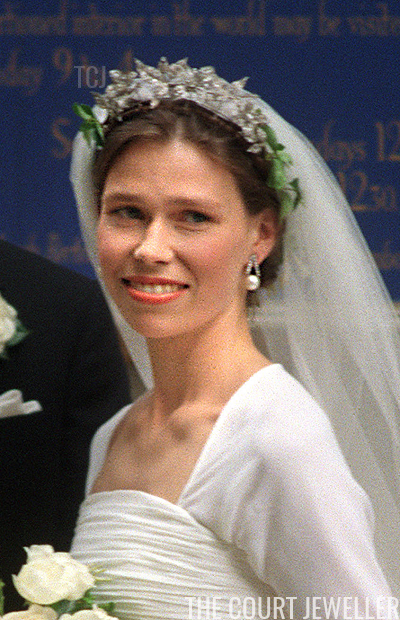 Wartski combined the brooches into a new floral tiara specifically for Sarah to wear on the day. Sarah chose to augment the diamonds with a wreath of greenery, adding a nifty whiff of genuine nature to the diadem. I'm going to speculate that Margaret actually gave this tiara to her daughter as a wedding gift. Sarah was photographed wearing one of the component brooches during the celebration of the golden wedding anniversary of Elizabeth II and Prince Philip in 1997, five years before Margaret's death. It would make sense that Margaret passed along a wedding present from Sarah's father to Sarah on her own wedding day. 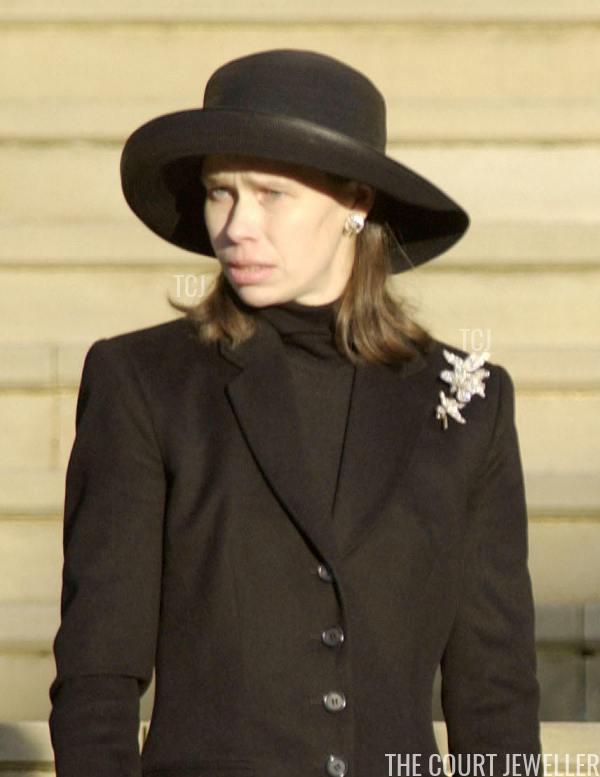 Sarah also wore one of the brooches for her mother's funeral in February 2002. 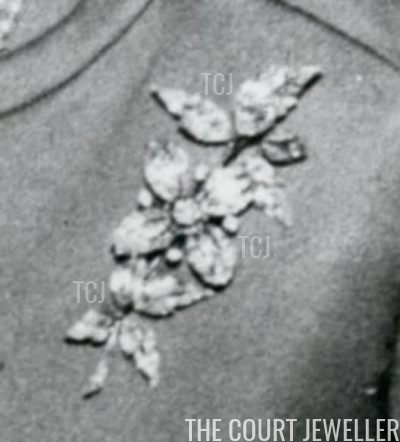 It seems that Sarah still owns the brooches today, as we've since seen them on another member of the Armstrong-Jones family: Lady Frances, the late Lord Snowdon's daughter from his second marriage. Sarah loaned the floral brooches to her sister for her wedding in 2006, and Frances wore them in her hair for the occasion.